The "iPhone 7" is not only shipping out to various countries in preparation for launch, but should go on sale Sept. 16, a report said on Wednesday morning, just hours ahead of Apple's official announcement. The phone should be available through Italian carriers TIM, 3, and most likely Vodafone on that date, sources informed iPhoneItalia. The people added that inventory of the device will be "very limited" in Italy, especially for carriers. Separate sources with Apple manufacturing partner Foxconn told the site that "iPhone 7" shipments are going out worldwide. Retail stores would need to begin receiving stock shortly to be ready for Sept. 16. 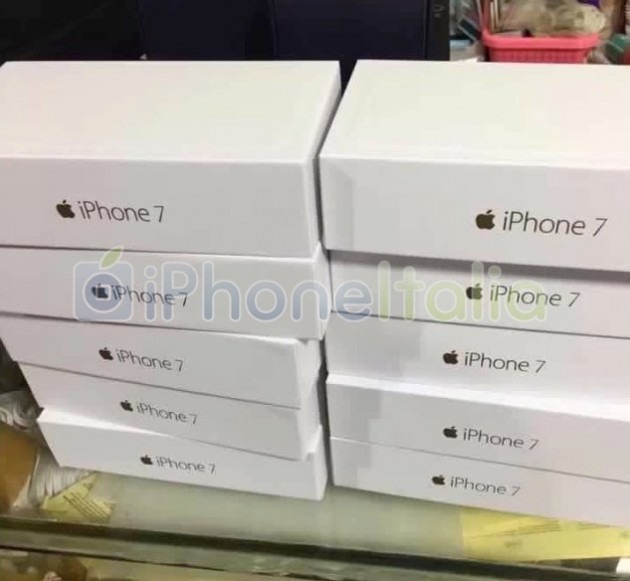 A supplied photo of a set of boxes appears to support the "iPhone 7" name, though the tops are missing product images as on packaging for the iPhone 6s. The boxes may simply be awaiting the images in label form. Apple is scheduled to hold its iPhone press event at 10 a.m. Pacific time. AppleInsider will be live in San Francisco to provide coverage.